You probably know that your credit score makes a difference anytime you apply for a loan. But it makes an even bigger difference when you apply for a mortgage. That’s mainly because the dollar amounts are higher with a mortgage, so small differences in your credit score can add up to big differences in your monthly payment. There’s also a secondary factor that applies to mortgage loans that could be even more affected by credit scores than the interest rate you’ll pay. Let’s take a deep dive into this topic, and look at the variations in mortgage rates by credit score. Hopefully by the time you’re done reading this guide, you’ll appreciate the reasons why you may need to improve your credit score before applying for a mortgage. Loan-to-value (LTV), which is the loan amount divided by the property value. For example, if you take a $200,000 mortgage on a property worth $250,000, the LTV is 80% ($200,000 divided by $250,000). There are other factors that will affect whether or not your loan is approved at all. Those include your employment stability, your income, and the acceptability of the property you’re looking to finance. In this Guide, we’re going to focus primarily on the impact of your credit score on your mortgage rate, since it has more influence than other factors . How and Why Does Your Credit Score Matter? Your credit score is a major factor in determining the rate you’ll pay for a mortgage. It may even determine whether your loan application is approved or denied. For our purposes, we’re going to focus only on the impact of your credit score on your mortgage rate, since the decision to decline a loan is determined by a number of factors even beyond your credit score. We’re going to be using data from the myFICO.com Home Purchase Center to illustrate the effect your credit score has on your mortgage rate. We’ll be referring to this information in the examples that follow. 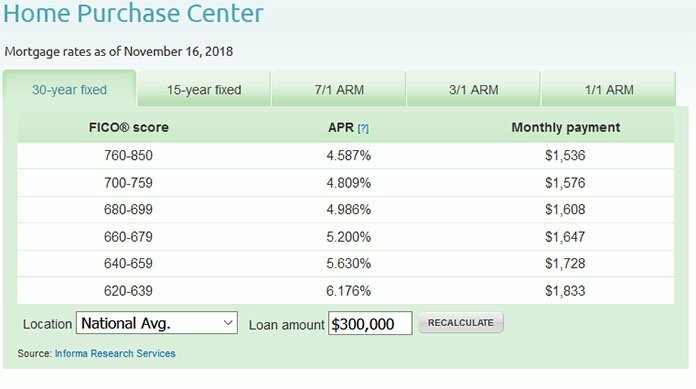 But even with a quick glance at the screenshot, you can see that your credit score range has a significant impact on the interest rate you’ll pay for the loan. We’ll go into more detail on this below. This is the X factor I was referring to in the opening section. When it comes to mortgages, most of the discussion of credit scores centers on mortgage rates. But there’s a secondary factor – PMI – where credit scores have a major impact on your monthly house payment. In the credit score examples below, we’re going to be making use of the MGIC Rate Card for PMI premiums on conventional mortgages. Conventional mortgages charge PMI on a monthly basis, anytime you take a mortgage with less than 20% equity in the property. That’s true whether you purchase or refinance the loan. The amount of the monthly premium will depend on the LTV of the mortgage (once again, the loan amount divided by the property value), the type of loan (fixed or adjustable), and your credit score. Mortgage insurance on VA and FHA mortgages. Both VA and FHA mortgages charge mortgage insurance with an upfront premium when you take the loan. The amount of that premium is determined by the US Department of Housing and Urban Development (HUD), and is the same for borrowers at any credit score level. FHA also charges a monthly mortgage insurance premium. It’s also set by HUD, and is the same for all credit levels. Excellent – generally a credit score greater than 700. Average to Good – generally a credit score between 620 and 699. Poor to Fair – generally a credit score below 620. Those are just very general credit brackets. 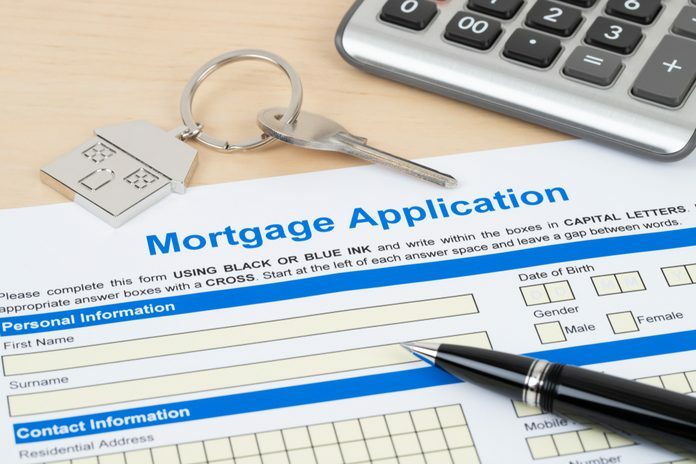 Since each has a wide range, your mortgage rate can vary significantly even within the bracket. But let’s look at each classification individually. Generally speaking, a credit score greater than 700 will get you the best mortgage rates available. There may be a slight advantage with some lenders – maybe just an eight of a point (0.125%) – for a rate of 750, but nothing dramatic. But when compared with the rates available for credit scores below 700, the difference is substantial. Rates don’t vary much from one lender to another. Since they all sell their loans to the same three agencies – Fannie Mae, Freddie Mac, and Ginnie Mae – pricing is standard from one lender to the next. Looking at the interest rate chart above, we see that a credit score greater than 700 has an average interest rate of 4.853%. That gives a monthly payment of $1,584 on a 30-year mortgage for $300,000. But when it comes to PMI, your mortgage rate will be even more influenced by your specific credit score. If you’re taking a $300,000 mortgage that represents a 95% LTV (5% down payment), your PMI premium rate with 30% coverage for a 700 credit score will be .78. That will produce a monthly PMI premium of $217.50 (or let’s round it up to $218). 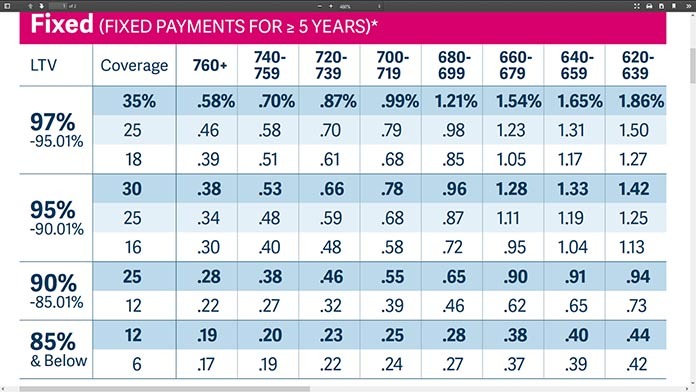 By contrast, if your credit score is higher than 760, the premium rate with 30% coverage will be .38. That will drop the monthly PMI payment to $95. Even though both credit scores are considered in the excellent range, at 700 and 760, and the interest rate is the same, there’s a significant difference with the PMI payment. With a credit score of 760, you’ll save $123 per month on your PMI premium. That’s a savings of $1,476 per year, or more than $14,700 over 10 years. Let’s compare the two credit scores, 700 and 760, and see how the monthly payments stack up. The benefits of having a super excellent credit score are obvious when you’re applying for a mortgage. In this credit score range, you can generally expect to be approved for a mortgage. At the same time however, both the interest rate and the PMI premium you’ll pay can vary dramatically between different credit score levels. Using the myFICO calculator again, let’s look at the outcomes in the higher credit score range – 680 – 699 – and the lower range – 620 – 639. In each case, we’ll assume a $300,000 mortgage, with a 95% LTV. The difference in the monthly payments is $340. On an annual basis, that’s $4,080. Over 10 years, it’s $40,800. That’s the result of an average difference in the credit score ranges of about 60 points. Put another way, if you have a credit score of 630, and you manage to increase it to 690, you can save yourself $340 per month – or more than $40,000 over 10 years. Generally speaking, you won’t be able to get a conventional mortgage with a credit score below 620. That’s generally the cut-off point for most conventional financing. But if you look closely at the PMI chart above, you’ll see that PMI isn’t even available if your credit score is below 620. However, that doesn’t mean you can’t get a mortgage with a credit score below 620. You can usually go as low as 580 with an FHA mortgage. The complication is that not all lenders will make an FHA loan with a credit score below 620. Even though it’s permitted on FHA mortgages, lenders don’t want to be held responsible for an early default if a borrower has a credit score that low. The other issue that matters when your credit score is below 620 is what factors are driving it. If you have a recent bankruptcy or foreclosure, or a consistent pattern of late payments or non-payments, you probably won’t be approved anyway. One other factor you need to be aware of is that lenders typically will not permit you to use a cosigner if you have bad credit. The general assumption is that bad credit by the primary occupying borrower cannot be offset by a cosigner. But if your score is below 620, mainly because you either have very little credit, or you have some bad old credit, you may still be able to get an approval. At least with an FHA mortgage. Make a down payment of 10% or more (the usual FHA required minimum is 3.5%). Your new house payment should not increase by more than 10% over your current one. You should have stable employment for at least the past two years. Your new house payment, plus non-housing monthly debts, should be less than 41% of your gross monthly income. If you can get approved for an FHA mortgage with those terms, there’s actually a silver lining. Since FHA mortgage insurance doesn’t vary by credit score, you have the same premium rate as someone with excellent credit. The premium rate is .85, which is $212.50 per month. That’s better than the PMI premiums for conventional loans in the 620 to 699 credit score range. Still, there’s no guarantee a lender will approve your loan even under those conditions. Realistically, you’ll need a minimum credit score of 580 to have any hope of being approved for a mortgage. Even that’s a long shot. 620 is the more reasonable score. But as you can see from the scenarios above, your credit score will have a major impact on your monthly payment. As we showed, with a credit score in the 620 to 639 range, the monthly payment (including PMI) came to $2,196 for a $300,000 mortgage with a 95% LTV. But with a credit score of 700, the monthly payment is just $1,802. The difference in the monthly payment is $394. That works out to be $4,728 per year, or more than $47,000 over 10 years. But by increasing your credit score by about 80 points, you can make that difference go away, and save a fortune on your mortgage. Do you think it’s worth the effort?